Like Bruce Wayne, I try to keep the lives of my geek alter-egos separate (though with less money and without the Batman part). I am a comics nerd, as these past two-dozen Longbox Graveyards attest, but I’m also deeply involved in iOS technology. I do role-playing games, too, and also boardgames. Hello, Ladies! What I rarely do is cross the streams. I keep my boardgaming separate from my work, which is separate from my comics, which is separate from my role playing. Distinctions without a difference for you; critical bulkheads against swirling descent into madness for me. 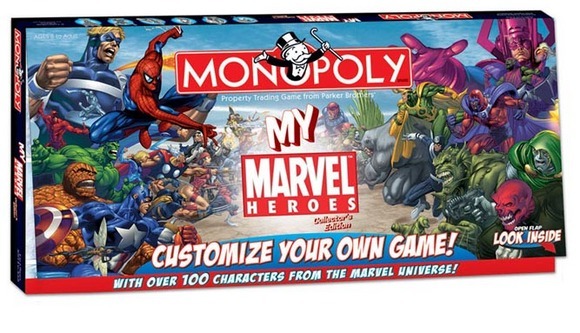 You Might Also Like: Battle Of The Superhero Deck-Building Games — Marvel vs. DC! But like those yearly JLA/JSA adventures of yore, sometimes crossovers are inevitable, such as when playing superhero boardgames. The problem with playing superhero boardgames (aside from the obvious problem of playing them at all) is that superhero boardgames are crap. Utter crap. There are occasional mass-market games that are memorable simply because they weren’t awful, such as X-Men Alert. Heroscape Marvel was a decent little superhero beatdown game, but it suffered for being built on the chassis of a predecessor system, and Hasbro abandoned the game almost immediately after launching it. Even venturing into the more quality-conscious hobby game channel yields spotty results for superhero games. Heroclix was successful for several years, but collectable games aren’t my thing (though I did play and enjoy Upper Deck’s Vs. Card Game for a couple years). Avoid the genuinely dreadful Marvel Heroes game released a couple years ago — that game was so dull that I couldn’t rescue it despite making Ben Grimm voices when playing with a table-full of comic book fans. If you want to play a genuinely good superhero game, I think you have only one choice. And two big problems. Your one choice is Capes & Cowls. Your problems are that it is a deeply strange and obscure game. And also impossible to find. I feel sheepish recommending a game you can’t buy for less than four hundred bucks on eBay. There’s no way you should pay four hundred bucks for this game. There’s no way you should pay four hundred bucks for any game (and this is coming from a collector who owns hundreds of obscure games). Why the inflated prices? Capes & Cowls is good. Not four hundred dollars good. But it’s good. The price is down to a couple factors. One — as noted above, good superhero games are hard to come by. 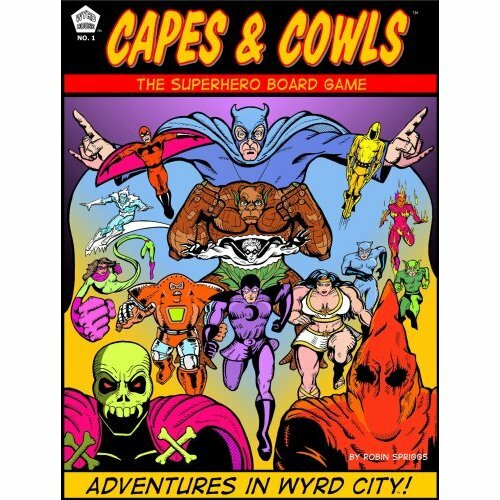 But more to the point, Capes & Cowls was produced in a limited print run by a source obscure even by hobby game standards (and we’re talking about a hobby that routinely sources games through foreign language sources in Germany, Japan, and Czechoslovakia). At heart, geeks are snobs. We sneer at geeks callow enough to embrace Phantom Menace, Star Trek with the bald captain, sparkly vampires, or goofy Batman. Boardgame geeks are an especially snobbish subcult, secure in our secret, superior knowledge that Monopoly is crap, and that only we few, we happy few, can appreciate the pure, cube-pushing joy of Eurogame optimization exercises where the objective is to fill shipping containers or impress the vizier. I say this as a guy who loves these games and has played them for decades. Despite what some boardgame geek correspondents would have you believe, playing Agricola doesn’t turn you into Alistair Cooke. But we sometimes act like it does. Because we boardgame geeks are a clannish lot, we’re convinced we’re the only ones who “get it,” and a boardgame design that doesn’t spring from our little pocket universe is bound to be one of those games — a Monopoly clone, a Risk! variant, a trivia game, or some dire roll-and-move kids game. When a game comes along that isn’t mainstream but doesn’t have a Eurogame pedigree and is also a fantastic design, it creates a kind of hobby snob cognitive dissonance. And that’s what happened with Capes & Cowls. The brainchild of Robin Spriggs — who hasn’t made a game before or since — Capes & Cowls is outside the mainstream of the geekstream that underlies the incredibly obscure designer boardgame hobby subculture. Pretty much out of nowhere, Spriggs cracked the code and created that rarest of beasts — a good superhero boardgame. And he did it on his own, without a big superhero license, and without a game designer pedigree. Spriggs’ Capes & Cowls is a mutant, an outlier, a prodigy, a savant, and that banjo-playing kid from Deliverance all rolled into one. 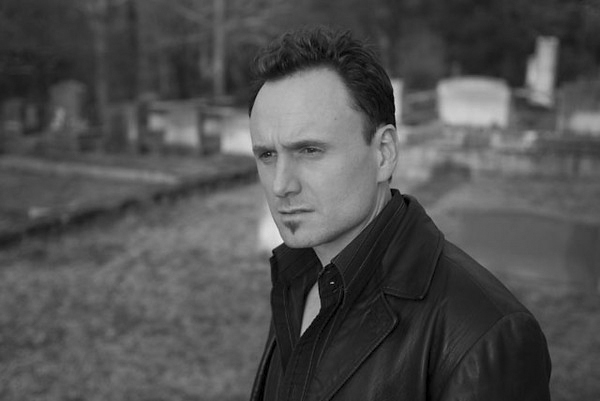 Who is Robin Spriggs? Poking around his Wikipedia entry and his strange-and-unofficial homepage stitches together a profile of someone who acts a little, writes a little, practices magic a little, and out of nowhere created this deeply wonderful superhero boardgame. Robin seems an artistic soul maybe not terribly interested in business. Near as I can tell he has zero contact with a boardgame community that regards his work with a kind of cargo cult reverence. And you know what? Good for him. The strange rarity of Capes & Cowls makes it a little more precious in this age of plentiful, on-demand geek swag like starship Enterprise pizza-cutters and Edgar Allen Poe bobbleheads. It wouldn’t disappoint me at all to see this game republished for a wider audience, but I’ll admit I take an obscure kind of joy that I was able to buy this game, for retail price, merely because I happened upon the fulfillment website when the stars were right and the game was offered for a brief and unadvertised time. Your basic box of garish cardboard and lot of pieces with tiny text all over them — the kind of thing to set a gamer’s heart beating like a trip hammer, and to make anyone else wonder what was so bad with playing Monopoly in the first place. To be fair, the components aren’t much. They’re nice, but there is a home-made quality to the game that can be off-putting (particularly if you just dropped four bills on this puppy on eBay). I prefer to think this mid-grade cardboard and cool-but-crude art is all part of a piece, a deliberate attempt to give you the Silver Age of comics in a box. And the rule book does hint at this, saying, “You hold in your hand an adventure machine — a do-it-yourself kit of super-heroic combat in which each game plays out like an action-packed issue of a classic comic book.” Amazingly, that proves to be true. Looking at this game from a distance, I was convinced that I’d love the system and hate the presentation. I fully anticipated that I’d have to rebuild the game after I got it, pasting up my own cards for Marvel and DC heroes that I cared about, and replacing the cardboard stand-up counters with cast-off Heroclix singles. 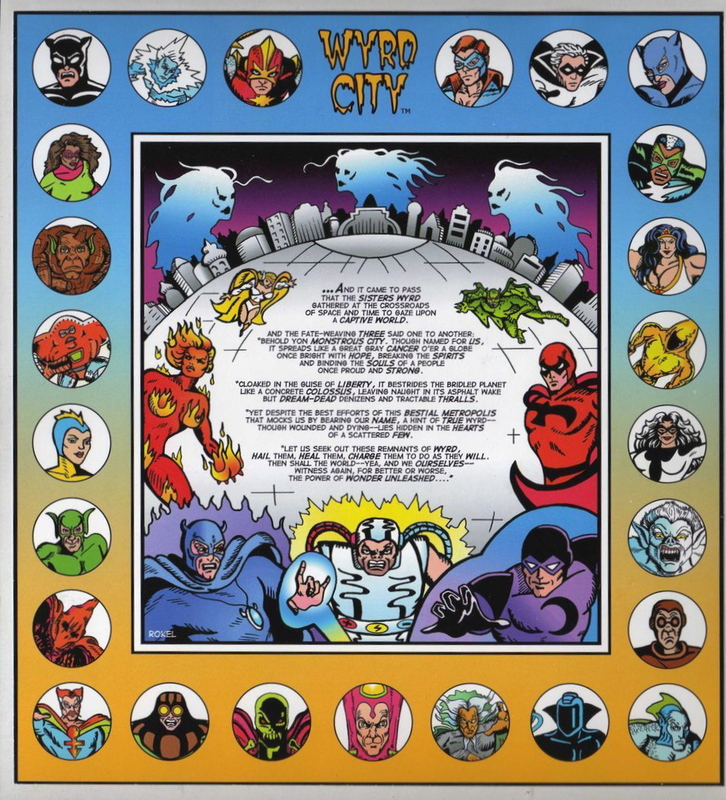 But when I got the game it worked a kind of strange, reverse-magic on me, as I (initially) bounced off the side of the game system, and instead fell in love with the earnestly strange world of Wyrd City and the heroes and villains revealed through the game. Who couldn’t be charmed by a hero like that? And there are thirty-two heroes in all, each with their own crazy backstory, like the Brown Recluse (“Driven mad by constant intrusion and overall lack of privacy …”), Blue Malkin (“Beaten half to death by her boyfriend-pimp, cat-loving call girl Tabitha Blake awakens in the care of an ancient sect of Bastian Priestesses”), Battery-Man (“… determined to shock the world … Battery-Man! He’s positively negative!”), and more. The more time I spent with the characters, and the more I started to glimpse of the game’s world and attitude, the less I desired to port this system over to the more familiar heroes I obsess about here at Longbox Graveyard. Reading the scenario book reveals a game that is an homage to comics but also its own thing, a morally ambiguous world where “… the ‘good guys’ are bad, the ‘bad guys’ are you, and the dress code is decidedly unusual …” and peace-keeping forces like The Freedom Patrol seem more than a little Fascist when you glimpse them from the corner of your eye. This is cool stuff, and hard to do — making a good game is hard, but having that game express a rich theme is harder still. And so, the game itself. It’s pretty simple, actually, with rules written in a conversational style, and much of the complexity off-loaded to the character cards, each of which allows a hero to alter or break the game rules in some fundamental and flavorful way. 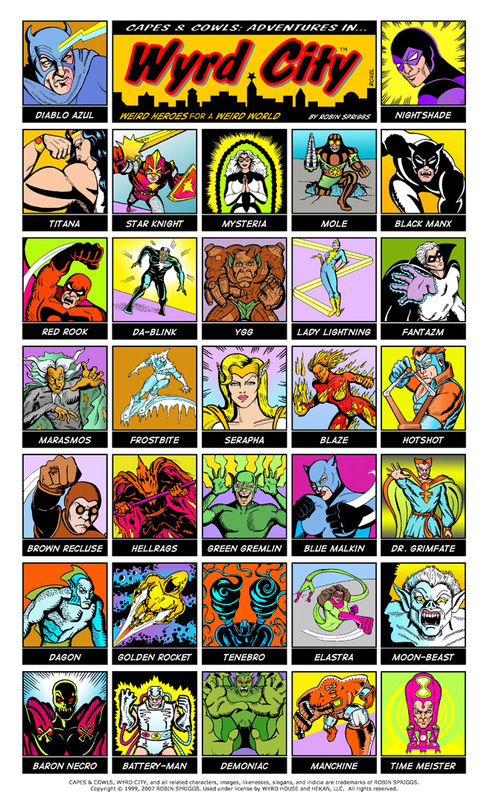 At its heart this is a superhero beatdown game — you pick a couple characters and go at it. Each character gets to activate once per turn, moving on a chess-like board, whacking away with fists, weapons, and superpowers to knock the other guy out before he does the same to you. The game system is a little more abstract and “thinky” than I expected, which is why I bounced off the side of it at first — in such a flavorful game, it’s jarring to accept that one abstract square on the chessboard has different properties than another, simply because of its color and number — but once I fought past that I found the game felt very much like a superhero battle. The game has some powerful mojo — those simple rules let the system become transparent, taking little imagination to see past the mechanics and witness a comic book battle unfold between your eyes. In the right frame of mind this really is an “adventure kit” — Baron Necro clings to the shadows, summoning zombies; Ygg stomps slowly about, trying to get his hands on the lesser foes that worry him like gnats; Golden Rocket streaks across the board, smacking into his foes like a living missile. Are the characters balanced? Are the scenarios thoroughly playtested? Who knows, and who cares? The game is fast-paced and fun, and frankly I’m too intrigued by the mysterious orbs on display in the “Better Safe Than Saarhi!” scenario to worry if Diablo Azul and Green Gremlin perfectly offset each other on the game board. Capes & Cowls is fun, innocent, knowing, subversive, flavorful, polished, and raw in all the right ways. I’m sorry it’s basically impossible for you to get a copy. You can’t have mine! I don’t get to play it nearly enough, but I did recently get my youngest to try it, so things are looking up! 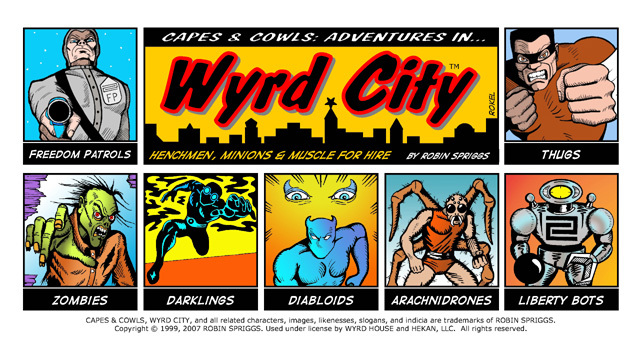 One final thing — apparently there are Wyrd City comic books, too. I’ve never seen one … never even heard of one being offered anywhere. They are either mythical or (impossibly) even more obscure than Capes & Cowls. But damn, I’d love to get hold of those books. And so my comic book collecting obsession comes full circle, mutated through contact with my obscure boardgame obsession, and another hopeless Grail quest is begun. 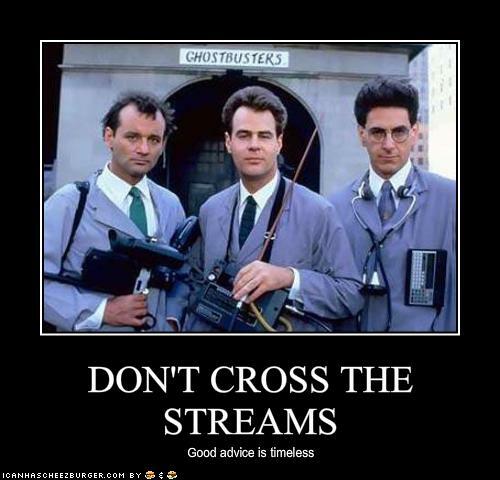 What was that warning against crossing the streams? Help! NEXT WEDNESDAY — #25 This Female Fights Back! 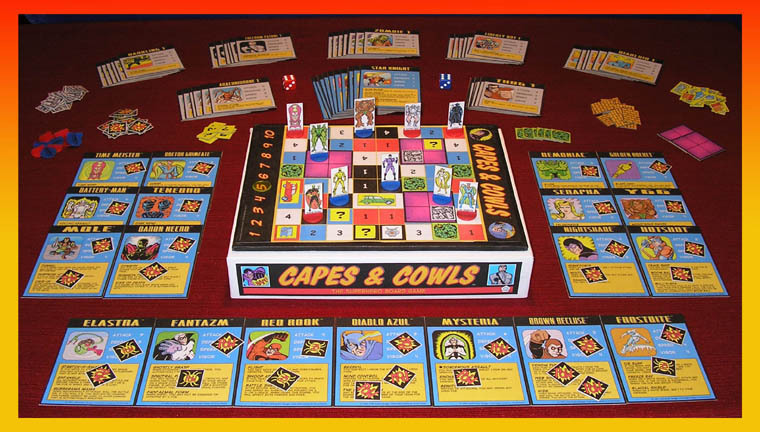 Posted on November 30, 2011, in Other Media and tagged Board game, Boardgamegeek, Capes & Cowls, eBay, Robin Spriggs. Bookmark the permalink. 20 Comments. (2) I was a board-gamer for a brief period of time in 1985-ish, and the game we played was Champions. Mostly we were interested in creating characters, and not so much for playing the game. I have no recollections at all about the game-play, or anything of that sort. I just remember that our group created some awesome-seeming characters. We may have just actually played once. But we spent hours and hours of time creating chracters. Thanks for the comment, Prof. Strangely enough, even though there is no comment thread, this article continues to get more hits than many here at Longbox Graveyard, mostly from boardgaming sites. There’s still very little on the web about this game, though there are perennial rumors of republication. It would be an ideal candidate for a “print and play” game distributed via PDF but who knows how friendly the original art files may be for that kind of retrofit. It wouldn’t surprise me if the whole job was pasted up by hand. I well remember Champions, and Villains & Vigilantes, and Superworld and the Marvel Superheroes Role Playing Game and a whole host of superhero RPGs from the 1970s and later. Might do a column about them someday, but I haven’t played a RPG in forever, and my boardgaming is pretty rare these days too. I do think Capes & Cowls a worthwhile game, for all that I don’t get to play it very much. It is certainly the best of a bad lot in this particular genre, and a very good game by any measure. Dang, I really want this game! $400 — ouch. That was a fantastic review. I know this was not a board game, but did you play the circa 2000 video game “Freedom Force”? I loved the silver age vibe there and the faux-Kirby artwork. It’s good but no where near $400 good. 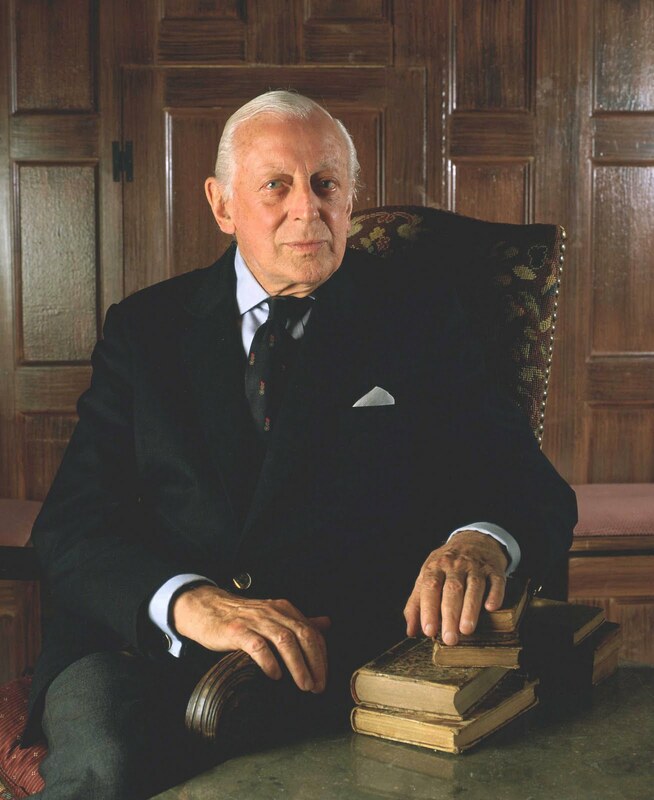 In this era of Kickstarter and boutique publishing it is bound to be back sooner or later. I never played Freedom Force (I’ve always been a Mac guy, and I think it was PC-only) but I well-remember the game’s Kirby-inspired cover art. Another independent Superhero game with great reviews is Heroes Incorporated. I bought it because its the only good Superhero board game at a decent price. It’s fun and its great. Check it out! I’ve never played it, but i think I’ve seen it. As I recall I was warned off by dodgy art (not that I let that keep me from Capes & Cowls, and of course I grew to love the C&C art). I’ll keep an eye open for a copy in trade somewhere, thanks for the recommendation. You can buy a new copy for only $12 on sale at this time (plus shipping). Which game are we discussing? Capes & Cowls is still shown as being out of print at the House of Nine site. I would love to give Capes & Cowls a try! It sounds really fun. Funny, how in this day and age of the internet and 24/7 accessability we could have something that simply cannot be found/bought. The lack of availability makes it even more compelling! Ah well. I will probably never get to try it. Thanks for the link, I will take a look! I am new to the game and love it. I went out and bought Hero Clix that have similar appearance to the Supers in this game, and use them instead of the cardboard stands. used for only 50 cents at my local game store. I also am replacing the Crime A,B,C… with generic thug Hero Clix. the biggest complaint about the game is the Crime A,B, generic battles, some have created cards to randomly describe the the crimes, some use the space and announce the crime in RPG style, I think replacing the crimes with figs is even better. Wise choice, pimping a game with new components can go a long way toward improving the game experience. Aesthetics count when it comes to boardgames. I’ve spent a lot of time in my gaming hobby painting figures, laminating custom play aides, etc. It is a happy sickness. Pingback: Double Decker « Geekend Forever!